Are you sure you want to know? : Someone got new Doggles! 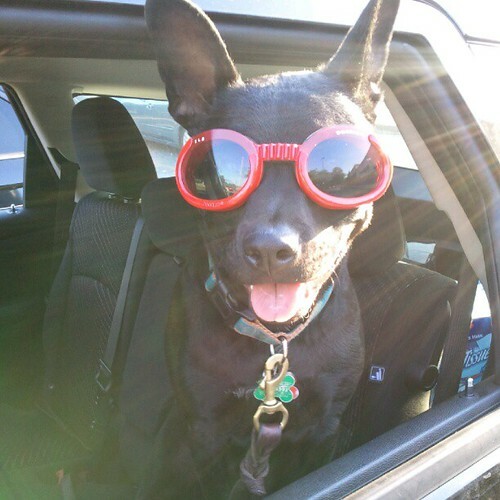 Someone got new Doggles!, a photo by Michael_Lehet on Flickr. I bought Deeohji a pair of Doggles. They're Goggles for Dogs and they're fabulous. Deeohji has always loved sticking his head out the window, but then show me a dog that doesn't. Since we drive mostly in the city we never really "get up to speed" so he gets to enjoy the wind blowing in his face. But when we get some speed, the wind is too much for him, so he usually just curls up on the seat and takes a nap....but now he doesn't. Now when we get on the expressway he just sticks his head out further because the wind just goes right on by. Since we've gotten him Doggles he's encouraging me to drive faster, run red lights and see what really happens when you hit 88 miles an hour! It's gotten so bad that when I come home from work he's sitting at the door waiting for me with his goggles on and ready to go for a drive!